“Asia is moving along a dangerously unsustainable energy path that will result in environmental disaster and a gaping divide in energy access between rich and poor unless the region dramatically changes course,” says a new Asian Development Bank (ADB) report. Asia’s Energy Challenge highlights the complex balancing act the region faces to deliver energy to all its citizens while scaling back its reliance on fossil fuels. In the face of this challenge, Asian nations have developed strong solar (20 GW) and wind (82 GW) capacity in the past decade. Their untapped potential offers great hope for a clean energy transition. In two nations, India and Italy, solar and wind are now at grid parity with traditional fossil fuels. “Countries cannot meet all their power requirements on their own, so Asia must accelerate cross-border interconnection of power and gas grids to improve efficiency, cut costs, and take advantage of surplus power. 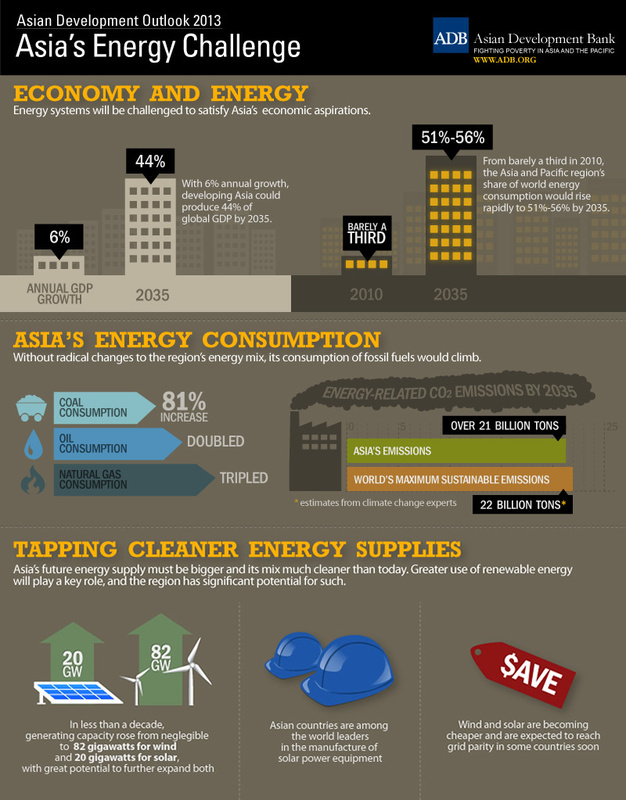 With increased cooperation, a pan-Asia energy market is achievable by 2030,” the report says. When banks say that renewables are competitive with fossil fuels and can provide the grid reliability we require, then this market is primed to accelerate. When the bankers say we need renewables – it’s time. Please like, comment, and share on Facebook and link! p.s Check out http://www.earthdash.org/index.php a terrific new on-line visualization dashboard, also inspired by Bucky Fuller’s vision for our planet.